Review OSHA stretch wrapping guidelines before making your pallet wrapping decision? There is a right way and a wrong way to pallet wrapping. 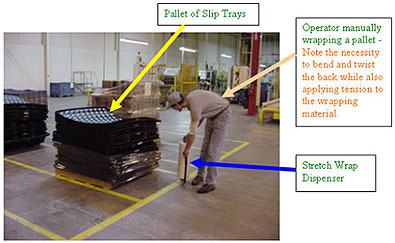 OSHA (Occupational Safety & Health Administration) has studied and identified potential hazards associated with stretch wrapping your pallet loads. With employee and product safety being critical to your company success, ensure you review and understand the pallet wrapping hazards outlined by OSHA. In identifying these wrapping hazards, OSHA has made suggestions for possible solutions to dealing with these packaging hazards, and we have detailed these below. Please review this information to allow you to make the proper pallet wrapping decision. Knowing and understanding the hazards and risks OSHA has outlined will allow you to make a more informed and safer decision. Hand wrapping pallets is an extremely difficult job if it is done correctly, and a common source of employee back injuries when performed incorrectly. Unfortunately, training for safe manual pallet wrapping is rarely available and is typically “on-the-job” training. The human form is simply not designed to walk hunched over manipulating an 8-10 lbs weight, while also trying to pull enough tension into the film to hold the pallet load together. Then 20 seconds later you are holding the same roll of stretch film above your head to do the top of the pallet, again tugging on the film using only your back and arm muscles. This arduous task put employees at risk of developing musculoskeletal disorders (MSDs). 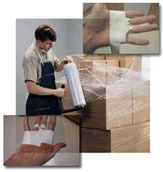 OSHA notes that many accidents and work related injuries are caused by hand wrapping pallets. The cost of these work related accidents are never considered until it is too late. The following information was produced by the Occupational Safety & Health Administration (OSHA) and is available on their website (www.osha.gov ). After a load has been built, it is generally wrapped with plastic to maintain its integrity during transit. Employees may be injured when performing this task manually. They must bend at the waist to wrap the bottom of the pallets while supporting the plastic dispenser (Fig. 11). Employees often stick their fingers into the open end of the tubes to stream off the wrap. This increases the risk of cuts to the fingers.